A sunspot is a relatively dark, sharply defined region on the solar disc - marked by an umbra (dark area) which is 2000 degrees Celsius cooler than the effective photosphere temperature. The average diameter of a sunspot is 4000 km, but can exceed 200,000 km. 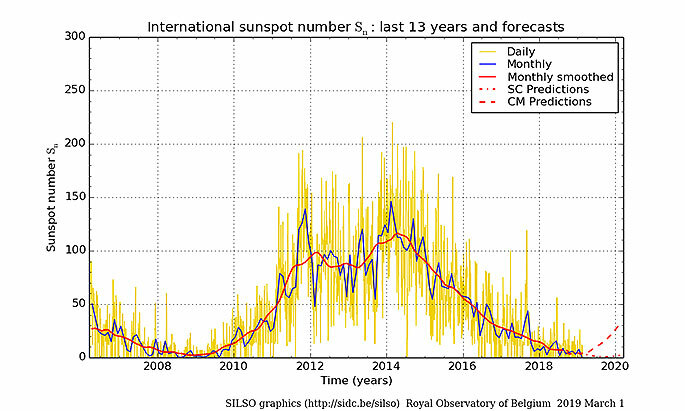 The NASA Solar Physics website (and other web sites such as the Royal Observatory of Belgium) includes information on sunspot numbers, the ‘Maunder Minimum', and sunspot cycle predictions. The sunspot index is updated monthly and available from 1749. The last time the monthly sunspot number was above 100 for any significant period of time was September 2002 when the value was 109.6, and the last time the value was above 200 was in August 1990 when the value was 200.3. The peak of latest solar cycle Number 24 was reached in April 2014, with a maximum of the 13-month smoothed sunspot number at 81.8. Since then, solar activity has steadily declined. The monthly mean sunspot number is now less than ten. As this late maximum comes more than 5 years after the preceding minimum in December 2008, cycle 24 has now entered its long declining phase, as none of the past observed cycles had longer delays between minimum and maximum. Therefore, the average solar activity should progressively decrease towards a minimum around 2019. We are currently over eights years into solar cycle 24. This the smallest sunspot cycle since solar cycle 14 which had a maximum of 64.2 in February of 1906. Since mid-2016, the Sun has occasionally been devoid of sunspots. These spotless disks will gradually become a familiar feature as the solar cycle is heading for its next minimum, currently expected by the end of this decade. The number of spotless days can vary significantly from one solar cycle transit to another. For example, during the previous minimum (around 2008), no less than 817 spotless days were recorded, whereas the minimum period leading into solar cycle 23 (around 1996) counted only 309 such blemishless days. As the current solar cycle 24 will gradually give way to the new solar cycle 25, several consecutive days and even weeks without sunspots will become the norm. In order to have an idea on the number of spotless days, and how these numbers compare to past solar cycles, the SILSO web site has created a “Spotless Days page”. This page contains graphs and tables on the accumulated number of spotless days, stretches of spotless days, and comparisons to other solar cycles – all supplemented with a word of explanation. The previous minimum surprised scientists and solar observers by being the deepest in nearly 90 years. Will the upcoming solar cycle minimum show as many spotless days, or will solar cycle 25 take off much faster than expected? The “Spotless Days page” will provide you with a front-row seat on the current status of the solar cycle minimum and the number of spotless days. Enjoy! Perhaps a new “Maunder Minimum” era is upon is!